The goal of a Montessori school is to aid in the child’s social and intellectual development, while recognizing the potential of each individual. The experiential-based curriculum is delivered in a dynamic environment. Students learn self-regulation through freedom of choice and movement. The curriculum offers a picture of the universe, the earth, and its life forms and human history. All areas of history are interwoven on a continuous basis and are taught in a progressive, ever-expanding way, repeating in greater depth as the child’s experience deepens. The classroom environment is designed with the elementary child’s developmental tendencies and characteristics in mind. The Lower Elementary consists of 6 to 9 year olds, and the Upper Elementary serves students 9 to 12 years old. Students are allowed the freedom of expression and movement within and outside the classroom as their inner discipline develops. They are encouraged to direct their own learning and to explore their own interests beyond the key lessons given in each of the academic areas. The community outside the doors of the classroom is also available to the children through academic Going Out excursions. A Going Out is planned by students to follow up or further their research. Children proceed at their own pace, progressing as their abilities allow. Using concrete materials and guided by the teacher, they build skills in a step-by-step process. In this manner, the classroom is a community where each child is able to develop his or her own individual creative abilities, thus fostering a non-competitive work environment. Our goal is to nourish the child’s enthusiasm and to establish a lifelong love of learning. The Montessori approach embodies concern and respect for the whole child. The development of a sense of responsibility, self-control, social sensitivity, and concern for the human community is considered equally important. 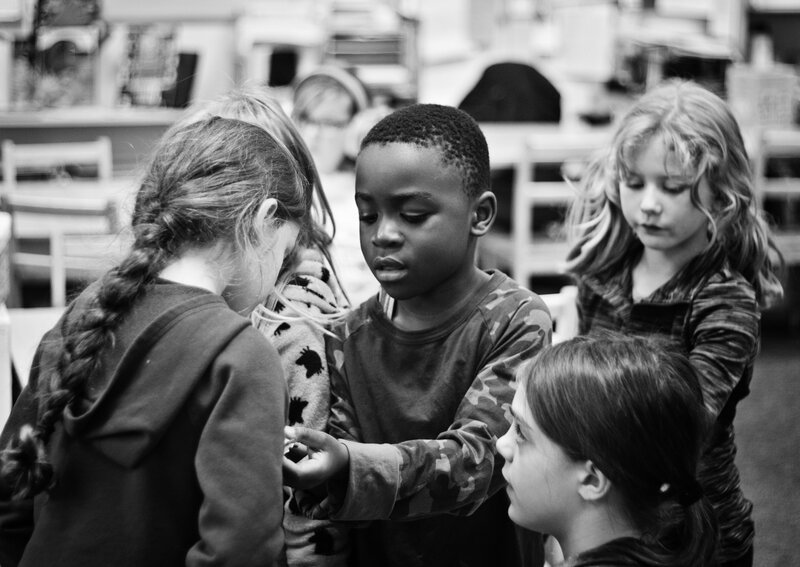 The elementary classroom’s mixed-age group naturally results in cooperation, not competition. This inspires the children to teach and learn from each other. Learning is inspired by the variety of work in the classroom as well as by the diverse student population. 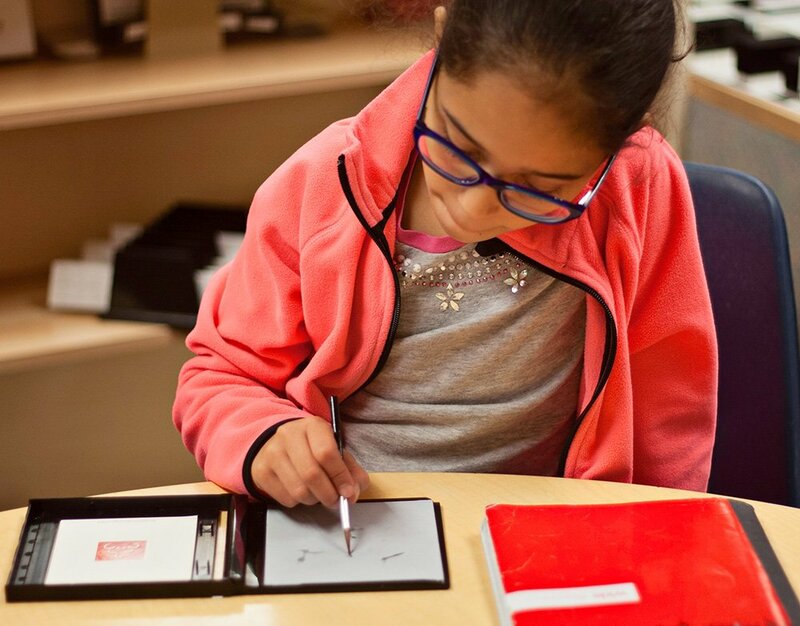 The Montessori elementary curriculum is designed to develop self-motivation in learning, responsibility to one’s self and the community, self-discipline, self-confidence, concern for others, academic advancement, physical fitness, and growth in moral and ethical understanding. Through exploration and discovery, the children find relationships and order in the world. They work in the areas of physical and life sciences, history and culture, mathematics, geometry and language. They are encouraged to follow their interests from beginning generalizations to discovery of details and refinements to deeper understandings and more abstract concepts. The curriculum is integrated rather than separated into discrete subjects and time periods. A child is encouraged to explore deeply, and typically is not called from study to go on to the next thing until the student has mastered a concept or feels satisfied with the learning accomplished. At about the age of 6, the child goes through many changes and reveals some characteristics not seen before. The child that was once observant, neat, reflective and quiet may now seem dramatically willful, fearless and independent. We see the child’s body growing at a tremendous rate, with the skin beginning to toughen and teeth making way for permanent ones. These are some of the physical signs that the child is entering what Montessori education calls the second plane of development, which lasts from approximately 6 to 12 years of age. The child’s questions have changed from “What is that?” to “Why?” The child develops a strong sense of justice and we sometimes hear what is often said to be the elementary child’s battle cry, “That’s not fair!” The child of this age is entering what is called the “age of reason.” The child’s intellect is no longer just gathering information, but is taking the information gathered, processing it and forming his or her own conclusions. This is the time when the child begins to establish independence away from the family, becoming less dependent on adults and much more interested in peer groups. These children seek to find their place and independence within the peer group to which they now belong. Elementary children want to know the reason for everything. Cultivating this desire for understanding within each child, the guide will plant “seeds of interest.” These lessons are designed to touch the child’s imagination and set fire to the intellect. This age of child has an irrepressible thirst for experiences. There are rapid changes occurring in the body and mind of the child, which tends to increase their sensitivity to the environment. Firmly rooted in the present, the tangible and the facts, the young child has difficulty projecting forward or backward in time, imagining information that is not concrete and separating fiction from reality. The children work toward functional independence, gaining positive social relations, and for refining their fine and gross motor skills. The materials and classroom environment are constructed so that the young child can satisfy the needs for development during this important formative period. A progressive development of concepts comes through the active use of hands-on materials and internalizing the mathematical processes involved. Actually showing these processes on paper comes as a last step in the sequence. Moving from the hands-on experience to abstract understanding, the curriculum introduces and the classroom allows exploration in addition, subtraction, multiplication and division; word problems; multiples and factors; fractions; decimals; squaring and cubing; measurement and geometry. They also work with square root, cube root, ratio and proportion, powers of numbers, algebra, negative numbers and non-decimal bases. The students work toward mastery of concepts at their own pace. Language work consists of sentence analysis; parts of speech; word study; creative and expository writing; silent reading; researching topics; orally presenting information; library use; and reading and listening to poetry, literature and other works. Language activities are often integrated with other subjects and reflect the students’ interests. Study begins with the fascinating story of the origin of the universe and our own world. It continues with investigation of developing life and the profound role of humans on the Earth. It may include aspects of prehistoric human activity and development of early civilizations and cultures, as well as more recent ones. Study may also include aspects of our own society and its local and national history. Seeing how humans in different times, cultures and places on earth have met their basic physical and spiritual needs helps us appreciate what the past has to offer. Students come to see that they too have a place in the story of what people do and accomplish. Students learn about plants and animals by looking at their needs, parts and the function of those parts. The effects of environmental conditions and their role in ecosystems are studied. Details of the various aspects of plants and animals are explored. Classification is introduced as a way of ordering the amazing variety we observe and as a further development of thinking in terms of logical relationships. The physical geography of the earth is studied, including basic land and water forms, the composition of the earth, plate tectonics and continental drift, erosion, effects of the relationship between the sun and earth, and the atmosphere and its dynamics. Political and economic geography is also studied. Beginning study of chemistry, physical phenomena, and astronomy are undertaken, using experience-based methods. Possibilities for further exploration are provided by opportunities to participate in an annual science fair. Students are encouraged to use various media to express themselves in their work in all areas of the curriculum. Lessons in the history and use of different media and techniques are offered on a regular basis. Projects focus on opportunities for individual development. Working in this way helps the child to appreciate her own creative abilities and skills, to develop a basis for esthetic judgment, and to become more aware and appreciative of varied media and works of art. Children are offered opportunities to explore the history of music, the writers of music and music’s form; to compose their own work and transpose others’ work; to enjoy and experience music through listening, singing, dance, the use of rhythm instruments and performance. Computers are a part of our society. They are available as tools so that the students have opportunities to become familiar with them and to develop skill in their use. However, they are not a substitute for active learning, so their use at this age is limited. The students learn keyboarding and word processing and have resource software available. Students may learn the parts of computers and various accessories, such as printers and modems. Access to the Internet allows them to extend their research beyond locally available resources. LCMCS also conducts state-required standardized testing via the OAKS online service. Developing the physical self involves aspects of coordination and control, muscle strengthening, endurance and self-confidence. These aspects may be developed through use of playground and obstacle course equipment; nature walks; gardening activities; dance sessions; organized and informal sports activities; and special outings. Group activities stress group learning, cooperation and having fun together. Skills and techniques are taught and learned in a non-competitive atmosphere. Students will take part in activities that help to develop an ecological perspective on life and a sense of responsibility for our environment. These activities help increase awareness and conceptual understanding of the natural world and a sense of belonging in the outdoors. Group experiences and time for individual reflection provide opportunities for better appreciation of our place in the world. Field trips, nature walks, gardening activities, animal and plant observation activities, raising salmon and trout fry, and other activities all work to this end. There are times when a student or small group of classmates find that the classroom environment does not provide all that is needed to follow interests. A student may need to talk to someone who can give expert advice regarding environmental law, or need information that can be found in a college library. The students may need to get materials from a hardware store. Whatever the need or interest, there is a place in the world outside the classroom where information or materials can be found. With preparation, planning and practice, the student goes out in a supported (specially chaperoned) way into the larger world of the community to get what is needed to accomplish the task at hand. Acting in the larger society in a supported, purposeful way allows the students to see the roles others play and to see themselves in relation to the world. Going out is an incremental process of developing the forethought, consideration, skills and self-confidence necessary to be a capable and responsible member of society.